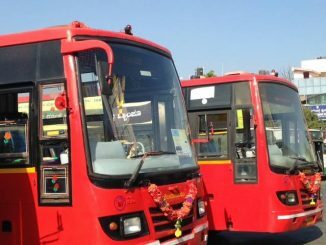 Seven reasons why I decided to ditch BMTC buses! It has been two years since the Metro was launched between Mysore Road and Byappanahalli. Since the day it opened, it has been my main transport to get to work. So much so that I can’t think of any other way of commuting to work! The issue since then has always been the last mile, the last 6kms from the station to the office. I decided to go with BMTC and the results have been mixed. On mornings, it would take anywhere between 20 mins and 45 mins for that distance, not considering traffic. Evenings, it took anywhere from 25 mins to 1 hour considering traffic. Mornings, I was mostly down to using one bus, and evenings I had to switch once. None of my colleagues who use the metro chose this option. There is a campus feeder that runs every 20-30 minutes and takes a lot less time between the destinations. I am not a fan of waiting for a feeder and being restricted to its timings. But I realised I was doing pretty much the same with the buses. 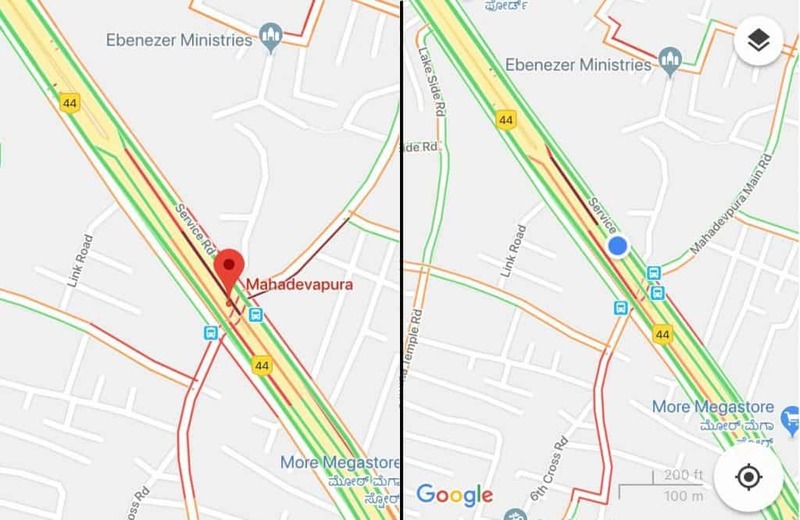 Once I ditched using BMTC to get to the metro station from home, parking my vehicle there, I was mostly consistent with what time I was reaching Baiyappanahalli. This made the argument moot. Extremely inconsistent scheduling. You reach Baiyappanahalli at a particular time, you expect to see a particular set of buses over a window of time. This happens for a month or two, and then they change things all over again. Not sure why they do this, but you might have had luck with finding your route for a couple of months, and then you’ll hit a phase where there are no buses for 15-20 minutes. Being forced to take a Volvo kind of makes it the same as taking a campus feeder in terms of cost while you still have to deal with their other issues. Staged! Anyone who travels regularly by BMTC can tell you about stages. The thing with stages is that before you hit the end of one stage, the conductor needs to issue all tickets. This sounds nice and innocent. Except that it plays out differently. 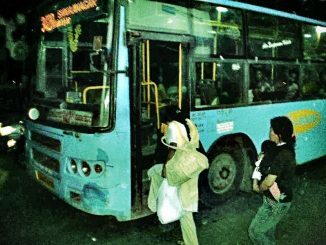 A bus waits at Byappanahalli, for 5-10 minutes, for people from metro trains to turn up. During this time, the conductor is either doing some bookkeeping entry with the BMTC staff, or hanging by the door screaming “MARATHALLI! MARATHALLI!”. Now, a stage ends after Byappanahalli. This means the bus starts with its new load of 40-50 passengers who need to be issued tickets in the next few minutes before it hits the next stop. What does the conductor do? Make the driver stop on the side between stops so that he can finish issuing tickets. Cue: Angry arguments with the crew. Targets! The bus crew have targets. Why this is needed when you are running a bloody monopoly, God only knows! This means that they hang around Baiyappanahalli, waiting for people to turn up. Then they wait near Tin Factory for the same reason, and again at KR Puram Railway station. It isn’t like they can convince someone to leave his car in the middle of the road and take the bus. The only people who benefit are those who’d have reached the bus stop a minute after the bus reached the stop, and if they had missed this bus, they would have taken the next available bus. And here’s a newsflash: either way the money goes to BMTC! Why wait then?! Bus-laned! Tin factory had a traffic problem. So they created one lane and moved all buses to it, so that large SUVs with one person sitting in it could move in peace. However Tin Factory is also a terminal. This means the same lane also has buses that are starting from there or terminating there. Which means, you are stuck behind buses that are in no hurry to leave without their initial loads. All for cars to move in peace. Flyover’ed! The pair of flyovers at Mahadevapura are designed in typical ORR flyover mode – two parallel flyovers so that buses can pass under them in that gap. On some days a truck will have collapsed near the middle and buses will have to take the flyover. On most days buses will be forced into the middle along with cars and trucks because the service road on the left, which could have taken the mostly left-turning Whitefield bound cars, is closed for all vehicles. This mass is forced to deal with very shoddy management below. Vehicles in cross direction flow constantly. Only the vehicles along the flyover are made to stop and go. When they ‘go’ they still have to deal with seconds-stealing two-wheelers and autos. The result? What would take seconds using the flyover takes 7-10 minutes for buses! Near Mahadevapura junction, the centre in the map is the path for the buses while the flyover is free of traffic. Flyover’ed again! The Doddanekundi flyover construction finished a few months back. Now to cross the road in front of the campus, one has to deal with vehicles coming murderously fast at you on the down ramp. During peak hours there is a warden who puts himself in front and gets the vehicles to stop reluctantly. Other times you are on your own, which is every day when I leave work. As much as I was good at dodging vehicles and crossing the road, I realised that it was a matter of time before some vehicle with my number on it would hurtle down the flyover. And that thought scared me no end! Traffucked! 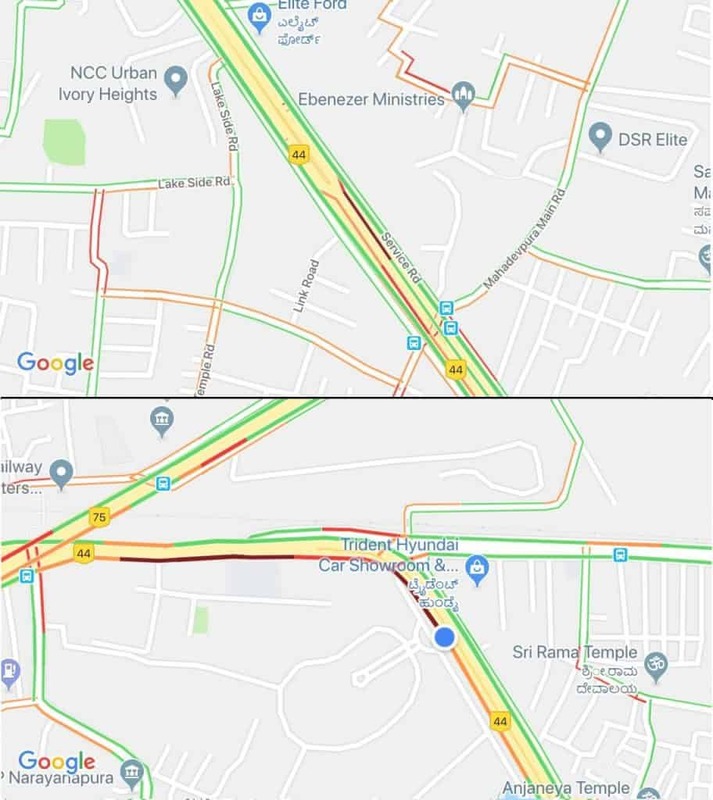 The metro construction on Outer Ring Road means that vehicles are stuck for a few kms. This meant that I had to get down sometimes near B Narayanapura and walk till KR Puram railway station. This worked fine until they started getting stuck well before Narayanapura. It wasn’t getting any easier. There is a kilometre long service road that can solve this problem, but like with most things Bangalore this is kept pristine and closed! KR Puram junction where the traffic is backed up on the main road while the service road remains unused. The feeder becomes attractive in terms of time and convenience. Fixed timings, get in and get dropped at work. Evenings, the first day he took internal roads and reached Baiyappanahalli in less than 30 mins. Next day he took the main road and took 10-15 minutes more. But it is consistent. At least there’s no swapping. I don’t know how long this will work. But almost everyone who has been on it, has been on it for years. At least until the KR Puram line opens, this might be the way to go. I did consider getting a cycle, or using Yulu bikes. The latter is a good option, and I might explore it. Trouble is days when it is raining or too hot. As much as I love public transport, this is not how you do it. You are punished by everyone, starting from vehicles on the streets when crossing the road, to BMTC crew with their rude behaviour, the BMTC system of targets, stages and bookkeeping, the traffic police by prioritising private vehicles over public transport, and the BBMP with their infrastructure targeted towards ever-increasing private vehicles and their putting the lives of pedestrians at risk. At the end of the day, using public transport should be about getting to work and then back home safely. It’s sad that millions have to depend on this kind of service to get to their workplaces. But when you have options you will eventually take them and move out. Unfortunately when the main public transport fails its users, it’s the city that loses. So long, BMTC! Note: This article was originally published on the author’s blog, and republished here with required permissions. 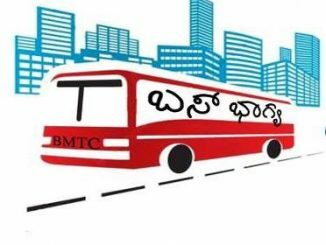 I liked this one..It isn’t like they can convince someone to leave his car in the middle of the road and take the bus..funny but very true..why will car users use BMTC if infra does not get better and takes almost same or more time than car/bike. Commuter rail is the answer for now and maybe ever for low income groups given the metro fares. Same here almost. Good work to show case the problem. Now, waiting for BMTC response..
1) Stinky Stations with bird droppings all over – Mysore Road is a model for how stations should not be maintained. 2) Disorderly Parking at the same station. The parking contractors are a dishonest and insolent lot. 3) The need to ride through roads, which are in horrendous conditions. The metro construction on Mysore Road has made it an inferno. There has been no progress as far as construction of Phase Two of Metro is concerned. BMRCL and its officials are good at lying. The bureaucrats at Metro blocked suburban rail for decades. I would like to tell these officials who live in their ivory towers that restrooms are more of a necessity. We can’t appreciate for your Rangoli Art Centre when your stations are stinky, dingy and adorned with bird droppings. Agree on most of your points. I am yet to have an issue with parking. Given how often we are riding close to the railway line, suburban rail could’ve done the job for a lot of places at a much cheaper cost. And in many cases could’ve taken the load off the roads during metro construction too. Can’t you suggest something better here? Why is that bangalore is taken as IT hub? Can’t the IT companies move out of bangalore? Majority of the Bangaloreans do not belong here, they are from different places..